Prehnite is a calcium aluminum silicate mineral, it’s crystal system is orthorhombic. It usually occurs in massive, botryoidal, granular or stalactitic habits, but can also (rarely) form prismatic, pyramidal or tabular crystals. The colour is usually yellow-green, but it can be yellow, white, grey or colourless. Prehnite is found in Australia, China, South Africa, Scotland and in New Jersey, USA. Epidote is an aluminium iron silicate mineral, its crystal system is monoclinic and it often grows in prismatic crystals. It can also occur in fibrous, granular or massive habits. Its colour can be black, dark green or yellow green. It forms in metamorphic and igneous rocks, in association with many other minerals, including Albite, Quartz, Chlorite, Garnet, Vesuvianite, Diopside and Calcite. Fine Epidote crystals have been found in Austria, Pakistan, Mexico, Norway, Mozambique and the USA. Prehnite is to be an Earth and Water element ally that brings joy to the heart and peace to the mind. 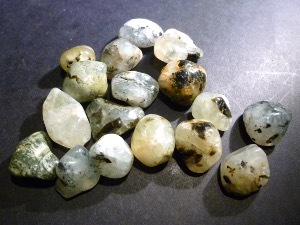 Prehnite is considered to be like a ‘emotional soap’ that may help wash emotional debris from the aura. Epidot may dispel critical-ness, enhances keen perception, stimulate participation and interaction, and supplements personal power. Some believe Epidot can raise the vibration of one’s physical self, allowing one to feel lighter, freer and less encumbered by the body. 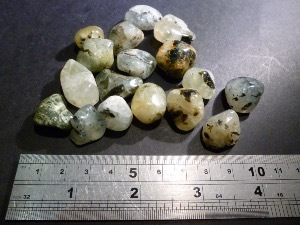 Prehnite tumbled to a smooth finish, an ideal pocket size stone, small enough to carry around with you. Tumble Stones can also be placed around the home for their energies or can just be nice decorative items. Prehnite crystal gemstones of varying sizes selected specially for your order.